Real Madrid boss Jose Mourinho is at the centre of a row after slating his own team on the eve of the Champions League clash with Manchester City. 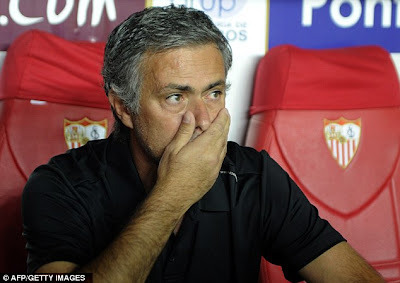 Mourinho blasted his side after they slumped to their second defeat in four La Liga games this term which left them eight points adrift of leaders Barcelona. The Portuguese claimed he 'didn't have a team' following the 1-0 reversal to Sevilla, comments which have riled former Madrid president Ramon Calderon. 'Mourinho's comments don't help the team in any way. The players could just as easily say that they don't have a coach right now,’ Calderon stated to RAC1. 'It would be better to see these losses as incidents. I imagine that the players are not too happy with Mourinho's comments. Mourinho has been forced onto the defensive early into his third season at the Bernabeu with the future of Ronaldo at the heart of much speculation. He was probed on Saturday night about the relationship between Ronaldo's mood and the team's performance.